Celebrated American funk bassist, singer and songwriter Bootsy Collins will release his new studio album “Tha Funk Capital of the World” in the UK on Monday 25th April 2011. The album features guest performances from Snoop Dogg, George Clinton, Ice Cube, Chuck D and Samuel L. Jackson, and many more. 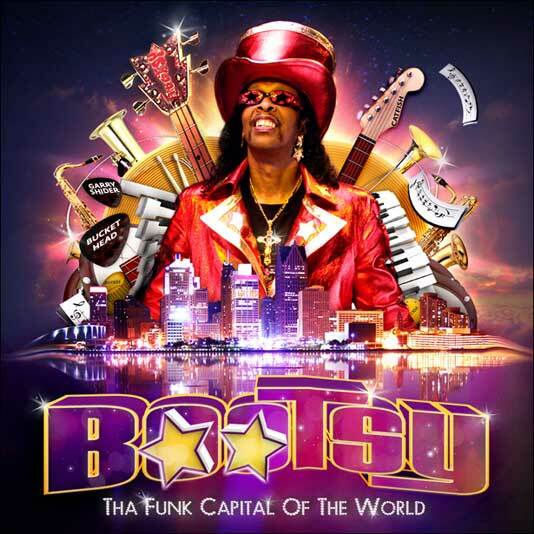 Tha Funk Capital of the World is Bootsy’s first new studio album of original funk material since 2002’s Play With Bootsy. The album artwork features a dazzling 3D lenticular sleeve. Get new single “JB-Still The Man” for free HERE!